The captain and first officer had decided to descend rapidly from 1,500ft above ground level to remain clear of cloud in the area. Some 30 seconds into the descent, the ATR 72’s terrain awareness warning system (TAWS) activated with four aural alerts – starting with “Too Low Terrain” and followed by “Terrain Ahead”, “Too Low Terrain” and finally “Too Low Gear” – in a 12 second period as the aircraft levelled to an altitude of 440ft. 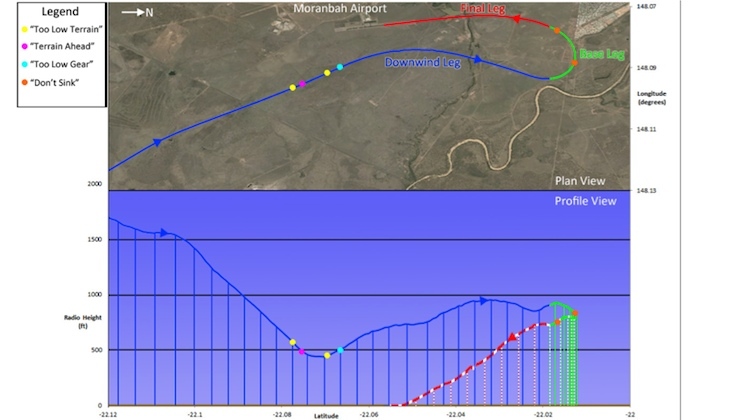 The ATSB report said the recorded average vertical descent speed during the descent from 1,500ft to 440ft above ground level – the lowest recorded height before the crew initiated a climb – was 1,750 ft/min. There were two more TAWS alerts later in the approach, before the aircraft made a normal landing. In response to the incident, the ATSB said VARA had provided additional guidance to crew regarding the reporting of all GPWS/TAWS occurrences and changed its internal reporting procedures. VARA had also added the processes for reporting terrain warning events to the flight operations policy and procedures manual, while supporting internal processes had been developed to ensure all reports were reviewed by the safety department and passed to the ATSB as applicable. Incidentally, VH-FVR is also the subject of another ATSB investigation after suffering suspected “significant structural damage” on a flight from Canberra to Sydney. VH-FVR was grounded in Albury from February 2014 until November that year, when it was ferried to Singapore. The aircraft is now back in service with VARA.